A recent Cincinnati Enquirer story went global, aided and abetted by the Associated Press. It was perfect click bait. The story said that at 96, Cincinnatian Henry Heimlich used his Maneuver for the first time to save a life (of a purported choking victim, 87-year-old Patty Ris, at the Deupree House senior residence). This is the third part of a series about my corrections requests regarding the lie my father told reporters. I contacted Ms. Chuck on May 31 to fact-check some information in her story. 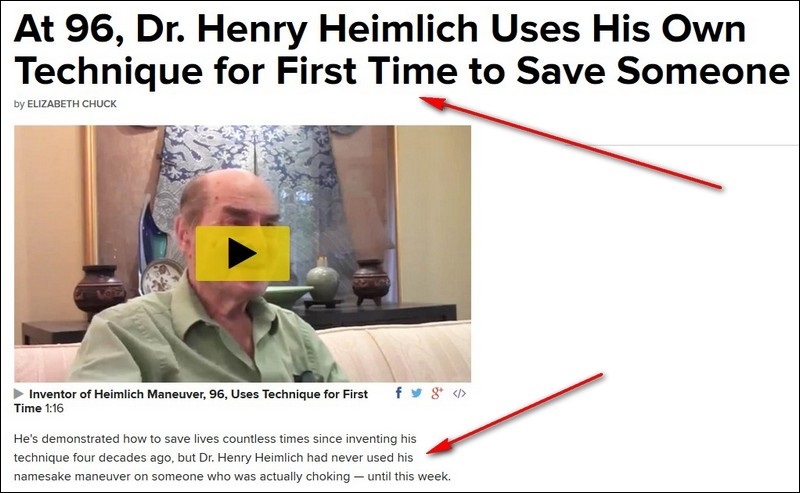 The next day I submitted a thoroughly-documented corrections request proving that this was not the first time my father claimed he'd rescued a choking victim with his namesake maneuver. I also explained that the story she reported had originated at the Cincinnati Enquirer and that hours after receiving my corrections request, the paper published a significant rewrite. I’m trying to figure out whether it’s worth doing an entire separate story on your father, not just an amendment to the original story, and I’d love to hear from you more about whether he has a history of making claims that have later been disproven or are unproven. Based on your blog, it seems the answer to that is yes. I'm always interested in moving forward newsworthy stories, so I agreed and informed her that in addition to other examples of my father's career history of making false claims, reporters at McKnight's and Slate had questioned the veracity of the story she reported. Ms. Chuck phoned me on Saturday June 11 and in a lengthy late afternoon phone call, I provided her with other examples of my father's history of fraud, including his lie claiming to have invented a surgical procedure to replace a damaged esophagus which he called "the Heimlich operation" and claimed was "the world's first total organ replacement." I also provided her with newsworthy information about other unreported or under-reported stories about the history of the Heimlich maneuver including my father's sordid attempts to harass and damage the careers of other physicians simply because they disagreed with him. Weeks went by and I didn't hear from her again, so I assumed she'd dropped the idea of reporting a story. I've had my time wasted by other reporters and I don't take it personally. But she still hadn't corrected the errors in her story, so on July 2, 15, and 18, I sent her courteous e-mails requesting the status of my original request. I received her confirmations of receipt to all of my e-mails, but no further response so I took it to Erika Masonhall in the communications department. I sent Ms. Masonhall two cordial inquiries and received confirmations of receipt, but no further response I took it upstairs to the office of NBC News president Deborah Turness. Yes, my family's name is misspelled. No, I'm not going to file another corrections request.